Sotrender presents the 4th edition of Fanpage Trends UK and the 2nd edition of Twitter Trends UK. Sotrender is happy to present the 4th edition of Fanpage Trends UK and the 2nd edition of Twitter Trends UK – the first comprehensive reports on the social media industry in United Kingdom. We analysed reach, engagement, customer service, and content on two of the most popular social media channels – Facebook & Twitter – in 11 integral industries. What are the biggest UK Facebook Pages and Twitter profiles? Which of them is the most successful at engaging fans and followers? Read the reports and gain the perspective on social media landscape in United Kingdom. Both of the reports contain data for 11 different industries present on Facebook in the UK. These are: All UK Brands, Alcohol, Banks, IT/Electronics, Beverages, Beer, Politics, Retail, Cars, Sweets, and Telecommunication. Christmas. 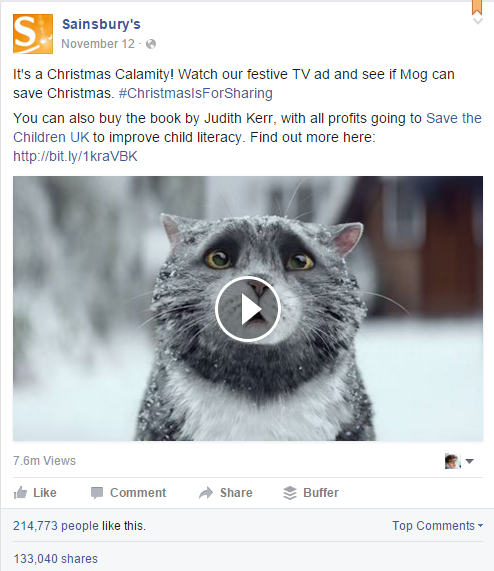 Sainsbury’s, the author of the best post of the month, mentioned Christmas Calamity and encouraged people to contribute to improving child literacy by buying a book by Judith Kerr, with all profits going to Save the Children UK already on November, 12th. Also second best post, posted by John Lewis, was about Christmas. On the other hand, 10 Downing Street, in its post placed fourth this month, wished fans "a happy and peaceful Diwali and prosperous New Year". In November UK pages published on average 42 posts on Facebook. The posts were almost 6% less engaging than in October, and gained over 6% fewer likes than in the previous month. On the other hand, they also gained over 5% more comments. What’s more posts published by commercial pages engaged over 22% less than in October. Britain First is absolutely the most successful Facebook page in the UK – among 100 best posts published in November by pages analyses by Sotrender, 35 were added by the party which also published the highest number of posts during the whole month – 1693. As we wrote in the editorial to the first edition of Twitter Trends UK, Twitter in the UK is totally dominated by musicians. This month’s edition of the report only confirms our observation. Harry Styles, who is the owner of the biggest Twitter profile in the UK with over 26M followers, was the author of 9 out of 10 best tweets of the month. Also both in November and in October and in September, the was the author of all three best tweets. He is not the one who tweets the most though. 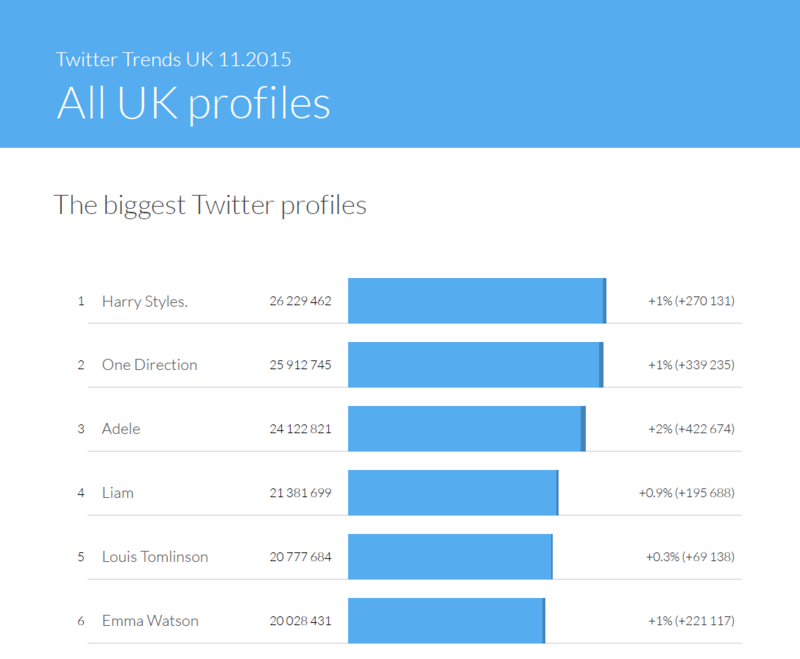 The highest number of tweets in November (and in October and in September) was published by the band One Direction. For a change, Adele was the one who three months in a row gained the highest number of new followers (over 423k in November), followed by One Direction in the last month and by Ed Sheeran in October and September. What’s interesting is the fact that 4 out of 5 most engaging tweets published by UK brands were publish by football teams with Chelsea FC, Manchester United and Arsenal FC topping the ranking. The fourth most engaging tweet was published by Liverpool FC while the only real brand in the ranking was Sainsbury’s asking its followers on November 12th whether they were already feeling festive yet. As this is only our second edition of Twitter Trends UK report, we would appreciate any and all suggestions and will be very grateful for your feedback in the comments below. It finally happened, since November you’ve been able to analyze the results of your Instagram activities in Sotrender. We all know that Instagram is one of the most important social media platforms at the moment, because more and more people are being drawn towards visual content rather than text. 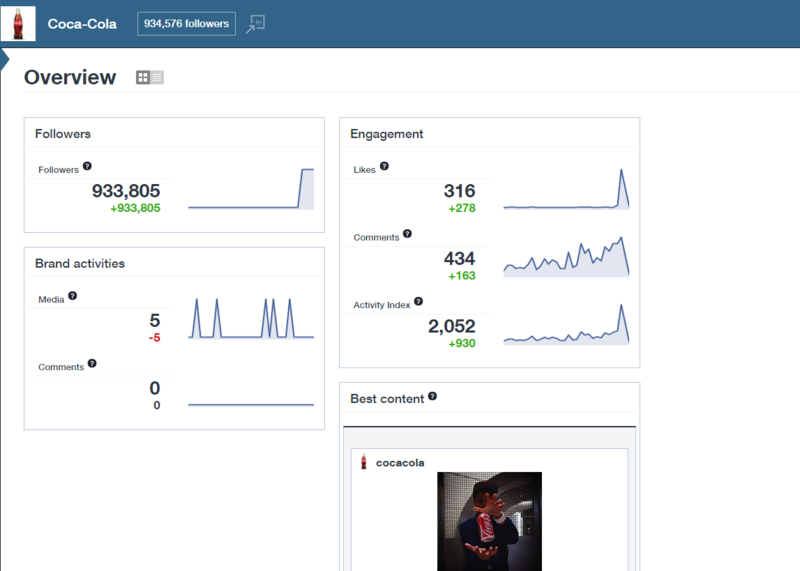 Similar to our other platforms, the Instagram panel shows you data and charts about your reach and content. You can analyze the performance of your hashtags on Instagram and check which one’s are getting the most engagement and which you should probably stop using. Feel invited to test Instagram analytics at Sotrender for free! We’re waiting for your feedback! Learn more what you can analyse!